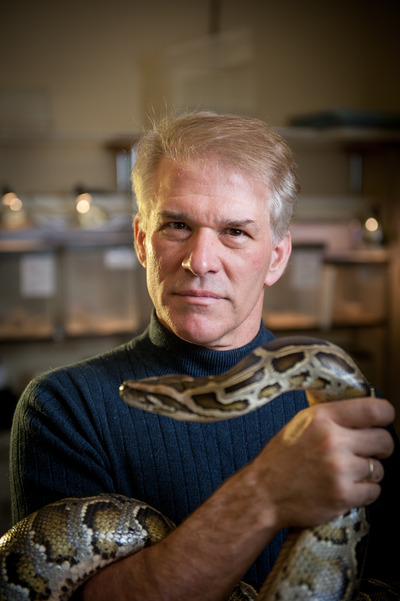 Dr. Stephen Secor knows snakes. The University of Alabama biology professor studies the physiology and digestion of the creatures, pythons and boas — like the anaconda — in particular. But when the producers of a new Discovery Channel show called “Eaten Alive,” which will supposedly shows a man named Paul Rosolie swallowed alive by an anaconda, asked him to assist in their production as as scientific advisor, he said no. What they wanted to do sounded like a crazy stunt that would be impossible to do without harming the creature, but even more, there seems to be no point. As someone who actually studied snake physiology, he knew there was nothing to learn from the gimmick, so he says he offered to help them develop a show that would be both accurate and fascinating. After all, anacondas fascinate people, without an absurd stunt. But he says they weren’t interested. “I was extremely disappointed that when given an opportunity to produce a show that would highlight the amazing biology of this animal, that Discovery went with a production that is only based on fear and sensationalism,” Secor told Business Insider. Discovery ChannelNot the sort of way people should see anacondas, according to Secor. Secor wrote the comment below in response to a change.org petition to stop the show from airing, explaining that he was shocked and saddened that anyone would consider producing such a show. The producers of this show did consider an alternative program on the anaconda, one that would be backed by professional scientists. However, Discovery went with working with an amateur naturalist and a show based on a stunt. When I spoke to the producers of this show, I also explained the damage such a show would have on the public’s perception of large constricting snakes and the work of professional scientists. Research over the past couple of decades has demonstrated the amazing physiology of these snakes and the potential for unprecedented breakthroughs in human medicine (just Google python physiology). Rather than highlighting any of this (which they had the opportunity), the Discovery Channel dropped the ball and has taken the presentation of the natural world to a new low. In an email, Secor explained to Business Insider that if they actually don’t have the snake swallow (or try to swallow) any part of Rosolie — and they don’t force it regurgitate anything — then it’s possible that they didn’t harm the creature, though he still doesn’t agree with any program that shows people jumping on, and struggling with, large snakes. But if the snake does try to swallow something the size of a person, it would stretch the creature’s esophagus to the point that it would extremely easy to tear, especially if they forcibly pulled that person back out. We’ve reached out to Discovery to confirm Secor’s prior discussions with them, but haven’t heard back. We’ll update this post if we do. When we got in touch with them for another story, they informed us that they weren’t releasing any more information about the show itself. “I just wished that I could have done a better job of convincing the producers from the start that such a show was a mistake,” Secor says.